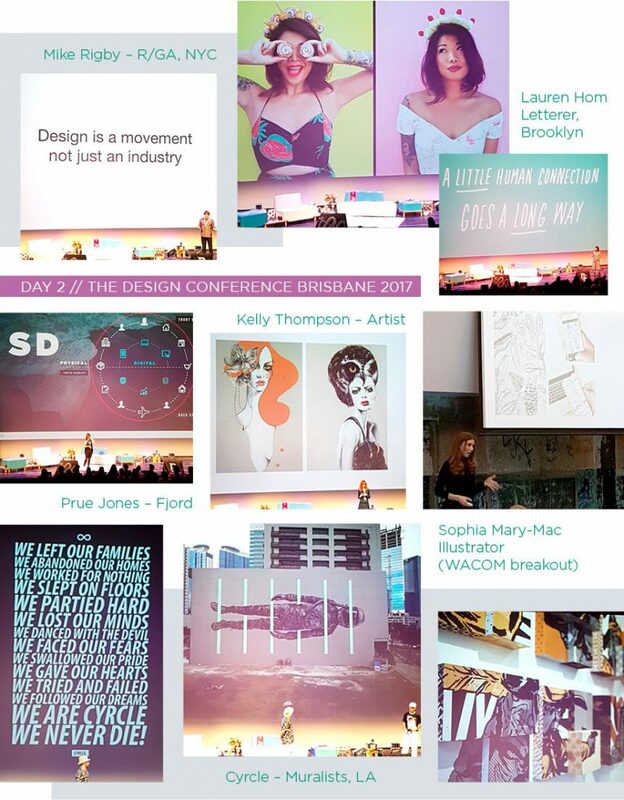 The Design Conference was a two-day experience for us Salty designers! Mike Rigby delved into client projects just enough to keep us interested and wanting more. The highlight was watching the videos from his project titled ‘love has no labels’. These videos captivated the audience and pulled on our heart strings. If you haven’t seen them – I recommenced you do! My favourite speaker of the day was Lauren Hom. Her presentation was polished and motivating. She showed empathy throughout her speech and connected with the audience by telling honest stories and not glossing over the strife in her life. Lauren’s pitch was to believe in your passion projects as these are the projects that have won in her life. I made note of many of her inspirational slides – such as ‘everything is design’ and ‘drunk conversions are creative goldmines!’. I was so inspired that as soon as I got home I read everything I could find on her – even purchased one of her prints! Prue Jones presentation was unexpectedly interesting. Prue works in Service Design (ie. design we all use but don’t own like Spotify and Netflix). A big part of Prue’s job is research, which meant she wanted to research us – her audience. She asked us all to visit the same website and we proceeded to answer questions on the large presentation screen by using our phones. We watched the data tally right in front of our eyes, it was great fun! Prue then went on to discuss the scary topic of Artificial Intelligence (AI). It was super-intriguing and made me realise how important it is to keep up to date with AI developments. Just as the audience was left shaking in their boots… out walks David Leavitt and David Torres from Cyrcle. I thought to myself “wow, this is either gonna make or break the wrap-up of this conference *wince*,” but it totally MADE it!!! Imagine two typical LA artists, who look like they have never left the 90s and who love their cat dearly! This duo was entertaining, funny, confusing and informative all at the same time. I appreciated their honesty as the pair scrolled through an endless number of photos, giving us a sneak peek of what their living / working lifestyle has been like. I will always remember watching as they told us when the Fresh Prince of Bel-Air attended their first art show and then proceeded to sing the theme song and dance around the stage, as if they had done this many times before!!! 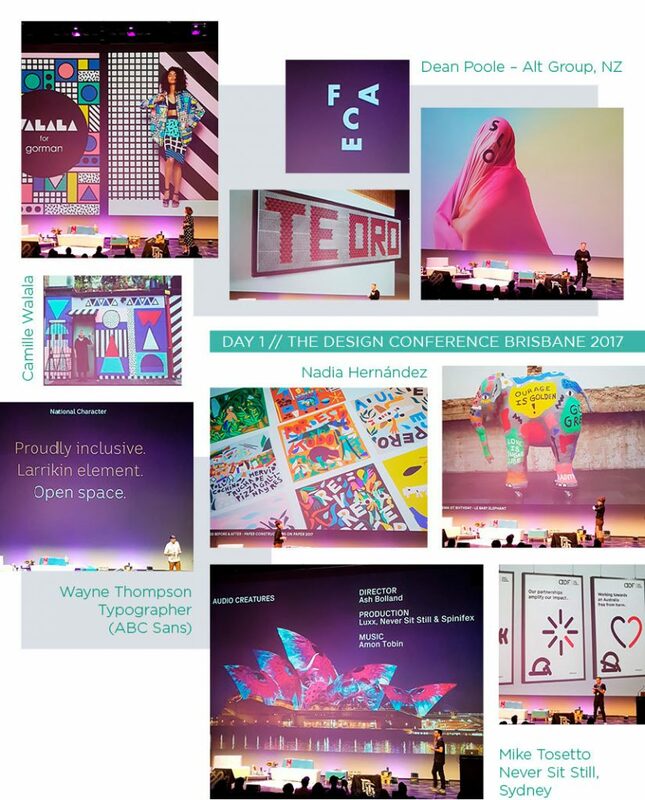 The Design Conference (TDC) 2017, had us excited to hear the future role of design in our world. With an awe-inspiring line-up, 680+ guests and a great location, we knew we were in for one hell of a ride! Representing Salt Design, I shared in the event with my two salty colleagues, two of our Salty clients and a (new) friend I made at last year’s TDC – which made it all the more enjoyable! So, what is it that drives this movement? Designers who have the hunger, the right attitude, the ability to amplify their creativity through technology, and understand the answer to the ‘why’. That’s what! It’s never too late to discover our creative journey, play more to develop our creative identity or take our side projects to the next level. As designers, we should always be learning, or as the guys from UsTwo put it –”shlearning!” (share learning). Working as a collaborative team who are willing to “give the world a wobble, ay” (Dean Poole, Alt Group), and solve design through human connection. Dean Poole – an extraordinary mind, full of creative twists! Such a wicked talk and not surprisingly the People’s Choice awardee! New Zealand designers seem to have a creative edge I find fascinating and Dean had us captivated within seconds. It was such a pleasure to meet Dean on Day 2 and thank him for blowing our creative minds! What a great way to kick off The Design Conference for 2017! French born, London based commercial artist Camille explained how she went from selling cheese, to failing to sell her work at market stalls, to partying in London, to collaborating and travelling the world creating murals, collaborating with fashion labels, restaurants, shopping centres and much more! Camille gave a great insight into the importance of creating opportunities for yourself – even if you have absolutely no idea what you are doing. That taking those opportunities works to your advantage and create even bigger and better opportunities – all you need to do is say YES! “It’s never too late to have fun.” Listening to her journey made me realise the importance of persistence and to keep creating even when things don’t work out as planned. Creative Director, Dean Poole gave a really engaging, interesting and inspiring talk. Some of his work was on the more weird and wonderful side, while others were more deep, spiritual and full of meaning. He explained many of his eccentric personal projects – which left the audience in hysterics! Dean has inspired me to want to consistently create, as he demonstrated that almost anything can be a creative personal project – if you want it to be. It was fun to get a small glimpse inside the mind of someone so interesting and creative. Dean encouraged me not to take your life too seriously and to start creating and doing the things I want to do NOW. Much like her work, Nadia’s talk was bursting full of passion, colour and energy. She focused on the theme of freedom and fear and explored the subject of “To be free, is to have no fear” and how she integrates that theme in her work using text, illustration and colour. Having graduated with a degree in Fashion, she then went off to pursue a career in graphic design. Nadia confessed that she didn’t actually have any drawing skills, that she couldn’t pattern make or even sew! Sharing this fact made me realise the importance of experimentation and how it’s helpful to finding what kind of style and practice of design especially works for each individual designer. Much like Camille’s talk, Nadia explored the advantages of taking any opportunities that come to you – as they can lead you to many unexpected creative ventures . . . even something as wacky as Youtubing how to paper mache a life-size baby elephant!